Statins – the most commonly prescribed of cholesterol-modifying drugs – work by inhibiting an enzyme (known as HMG-coA reductase) responsible for the manufacture of cholesterol in the liver. However, that enzyme is also responsible for the production of something clled coenzyme Q10, which plays a role in energy production in the body. Some people have speculated that at least some of the side-effects of statins are related to their capacity to deplete the body of coenzyme Q10. It stands to reason then that drugs that are more potent inhibitors of HMG-coA reductase will be more effective at lowering both cholesterol and coenzyme Q10. Now, it seems, there is some evidence that supports this idea. A group of US-based researchers trawled through data available from the Food and Drugs Administration’s (FDA) ‘Adverse Events Reporting System’ . Specifically, the researchers were looking to quantify the muscle-related side effects for individual statins. The researchers looked at data from a six-year period (2005-2011) during which there were about 148,000 reports of muscle-related problems related to statin-taking. It should be perhaps borne in mind that the real number of adverse events are likely to be much higher in the real world. It’s a reality that a significant chunk of adverse events go unrecognised or unreported. What this recent research showed was that, generally speaking, the more ‘potent’ a statin, the more likely individuals were to have muscle-related side-effects. 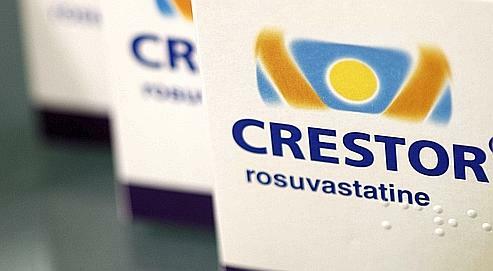 The worst statin in terms of side-effects was rosuvastatin (Crestor). The next most problematic statin was atorvastatin (Lipitor), followed by simvastatin (Zocor), pravastatin (Pravachol), and lovastatin (Mevachor). It’s a message I fear will fall on deaf ears. The current vogue is for doctors to be convinced that cholesterol lowering is inherently good and that, generally, the lower the cholesterol, the better. This almost inevitably pushes prescribing habits towards favouring of the more potent statins. This latest evidence suggests any drift in this direction may well be a retrograde step. 1: Hoffman KB, et al. A Survey of the FDA’s AERS Database Regarding Muscle and Tendon Adverse Events Linked to the Statin Drug Class. PLoS One. 2012;7(8):e42866. Epub 2012 Aug 22. OBJECTIVE To determine the effect of statin use on progression of vascular calcification in type 2 diabetes (T2DM). RESEARCH DESIGN AND METHODS Progression of coronary artery calcification (CAC) and abdominal aortic artery calcification (AAC) was assessed according to the frequency of statin use in 197 participants with T2DM. RESULTS After adjustment for baseline CAC and other confounders, progression of CAC was significantly higher in more frequent statin users than in less frequent users (mean ± SE, 8.2 ± 0.5 mm3 vs. 4.2 ± 1.1 mm3; P < 0.01). AAC progression was in general not significantly increased with more frequent statin use; in a subgroup of participants initially not receiving statins, however, progression of both CAC and AAC was significantly increased in frequent statin users. CONCLUSION More frequent statin use is associated with accelerated coronary artery calcification in T2DM patients with advanced atherosclerosis. I came off statins. I didn’t tell my Doctor at first, that I wasn’t taking the tablets I collected from the pharmacy. Eventually I realised I was wasting NHS money, so I came clean and told her. I didn’t want to take statins any more. She brooked no argument, but she did say I was taking a risk because my cholesterol would rise. It probably has, but I haven’t felt this well in years, and it all started when I gave up bread, sugar and other starchy food. I can’t advise anyone of course. I can only say what my experience was. I just got the results of my basic lipid test, 6.3 for the total, and 3.9 LDL which got a double asterisk but nothing commending the .6 for the triglycerides and 2.1 HDL. Basically the same results as the last one, two years ago and the one three years ago. Fortunately, my GP is receptive to my non-worry of “cholesterol” so he won’t have an issue writing a script that won’t be filled. I like the charts from the Hunt Study, ta for the heads up. I asked not to have the psa tested, but the nurse insisted. It dropped from 1.1 to 1.0. This is very interesting as my sister has heart problems and is on statins, and her condition is getting worst, she has dreadful pain in her legs and arms and cannot walk very far without becoming breathless, her doctor believes it is her heart , but she is convinced it is the statins. Unfortunately she is afraid to come off them as this will cause problems with her doctor. To determine the combination of drugs and vitamins, and their doses, for use in a single daily pill to achieve a large effect in preventing cardiovascular disease with minimal adverse effects. The strategy was to simultaneously reduce four cardiovascular risk factors (low density lipoproteincholesterol, blood pressure, serum homocysteine, and platelet function) regardless of pretreatment levels. The formulation which met our objectives was: a statin (for example, atorvastatin (daily dose 10 mg) or simvastatin (40 mg)); three blood pressure lowering drugs (for example, a thiazide, a β blocker, and an angiotensin converting enzyme inhibitor), each at half standard dose; folic acid (0.8 mg); and aspirin (75 mg). The Polypill strategy, based on a single daily pill containing six components as specified, would prevent 88% of heart attacks and 80% of strokes. About 1 in 3 people would directly benefit, each on average gaining 11-12 years of life without a heart attack or stroke (20 years in those aged 55-64). Among people without existing disease, the most discriminatory screening factor is age. As 96% of deaths from ischaemic heart disease or stroke occur in people aged 55 and over, treating everyone in this group would prevent nearly all such deaths. The best approach is therefore to treat people with known occlusive vascular disease and everyone aged about 55 or over. There is no need to measure the four risk factors before starting treatment, because intervention is effective whatever the initial levels of the risk factors,11 nor to monitor the effect of the treatment, because fluctuations within individuals tend to mask variations between individuals in the systematic effects of the interventions. A low cost Polypill could use generic components that are not subject to patent protection (simvastatin (from mid-2003), hydrochlorothiazide, atenolol, enalapril, folic acid, and aspirin). This formulation does not have the lowest rate of adverse effects, but even if about 10% of people were intolerant of the formulation it would still have considerable public health merit. Those found to be intolerant could be prescribed alternatives to avoid the side effects. Controlled trials of different formulations of the Polypill would provide direct estimates of acceptability. We need a widespread viral campaign (where people report their side effects) to discourage doctors bullying us into taking these wretched useless and harmful statins. We can also help save the NHS about 2 billion pounds on prescriptions and cholesterol tests. I came off Simvastatin a year or so ago a was put on Fibrazate XL 400mg as from reading your articles and my own experiences with muscle cramp I thought I would try these. However I read very little about bezafibrates are they known to have just as many side effects? I take a 50mg capsule of ubiquinol daily should I take more at 63? Is the use of cholesterol in mortality risk algorithms in clinical guidelines valid? This has some simple graphs showing clearly, for women, regardless as to whether we look at risk of death from all causes or just cardiovascular disease of different Total Cholesterol levels a TC level of 7 is probably safest. Zoe Harcombe has done similar number crunching on Cholesterol levels and All Cause/Cardio deaths and a similar picture emerges. A link in the above post was faulty hopefully this will work. On the subject of bad science, statins get a passing mention in an article (book plug too I realise) by Ben Godacre on The Guardian, his thrust is the scandal of the difference between the MUCH higher success rates of industry-funded vs government-funded research into drug effectiveness (and the explanations). He (too) is a doctor and tells how he has found himself prescribing drugs, based on the publication of selective results, later shown to be worthless (or worse). See http://www.guardian.co.uk/business/2012/sep/21/drugs-industry-scandal-ben-goldacre (I don’t think this has been mentioned on the blog before, but I got some odd error when I did a search). Ah, within an hour or so of posting my comment above, Goldacre happens to be on BBC R4 12:30 (You and Yours? not always sure what I’m listening to! ), where his view that GPs are influenced by drugs companies’ reps is outdated (hospitality, cherry-picking data etc). He is arguing for disclosure at the least, and no contact would be better, the opposer (not sure who) tells him he is 30yrs out of date; although later they do agree about the general problem of cherry-picking data. Also discussion of patient groups being influenced and funded by the drugs companies. A small comment how statins made their way into BBC soaps, yesterday in Holby City, one of the doctors in the series said he would like to see statins in the tap water, a bit disappointing that drama writers can keep away from things like that. I stopped taking Crestor and the frequency and severity of cramping quickly reduced. Has it gone away completly? Not yet. The reduction however is significant. Leave a Reply to charles grashow Click here to cancel reply.